The cuirassier harness of Johann von Sporck in the Heeresgeschichtliche Museum, Vienna. To my knowledge his wealth came from land and leading imperial armies, not from eccentric cutlery. The seventeenth century is a depressing period for lovers of European armour. 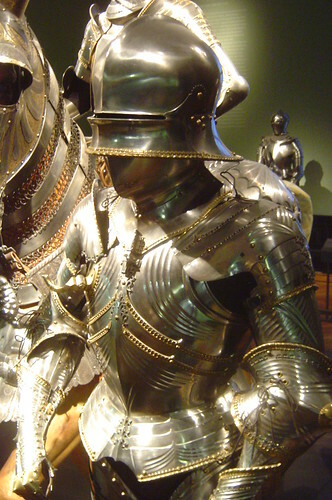 Europe was desperately poor and wracked by war, while a fashion for very heavy muskets fired from rests meant that armourers could no longer promise to protect most of the body against the most common dangers at a bearable weight, and the sports which had kept the nobility patrons of armour had fallen out of fashion. 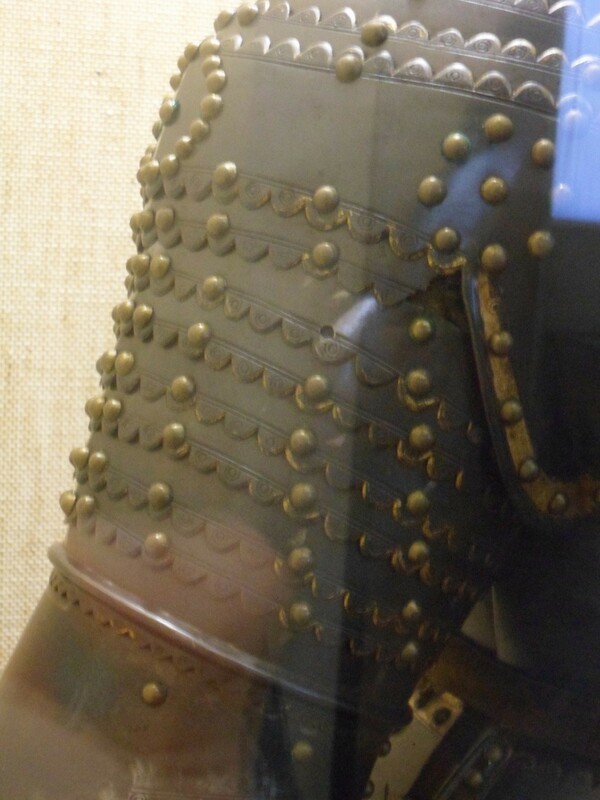 Both the use of armour and its beauty and craftsmanship collapsed. Spend a few minutes looking at the lines of this suit from the end of the fifteenth century. Watch what it does to the form of the body inside it. It at once encloses the wearer in a sword-proof metal shell, and shapes the his body towards his culture’s ideal of male beauty. 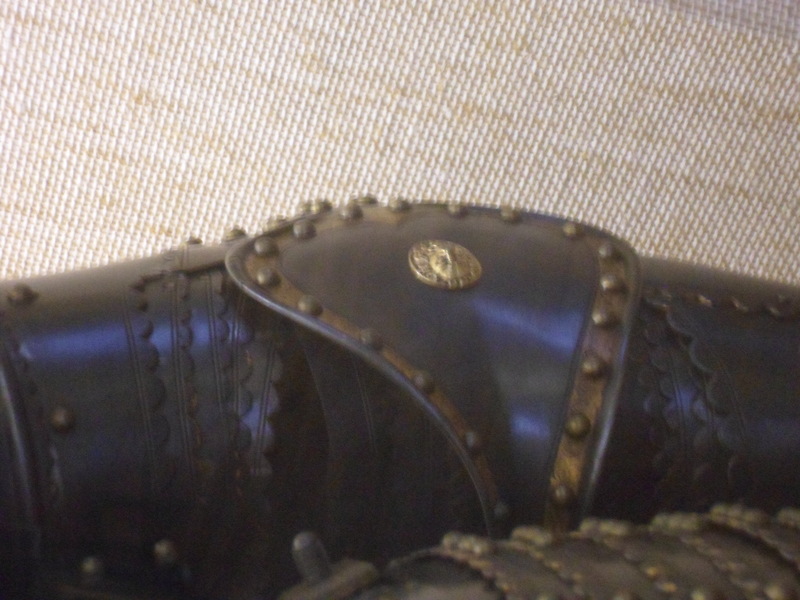 It is no coincidence that armourers in sixth-century Greece, sixteenth-century Japan, and seventeenth-century India all modeled their breastplates on an idealized human chest. 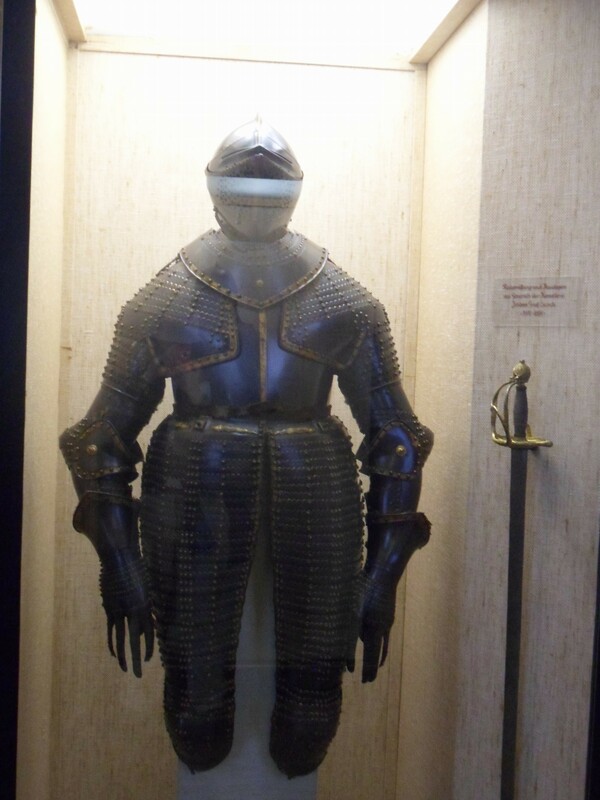 The Museo Diocesiano in Mantua seems to mount its armours on female manequins to obtain the narrow waist which they demand, and an armourer whom I very much respect thinks that these cuirasses likely compressed their wearers from side to side in the gap between ribs and pelvis. Every surface is worked as intricately as a piece of jewelry, or perhaps as a mechanical watch. 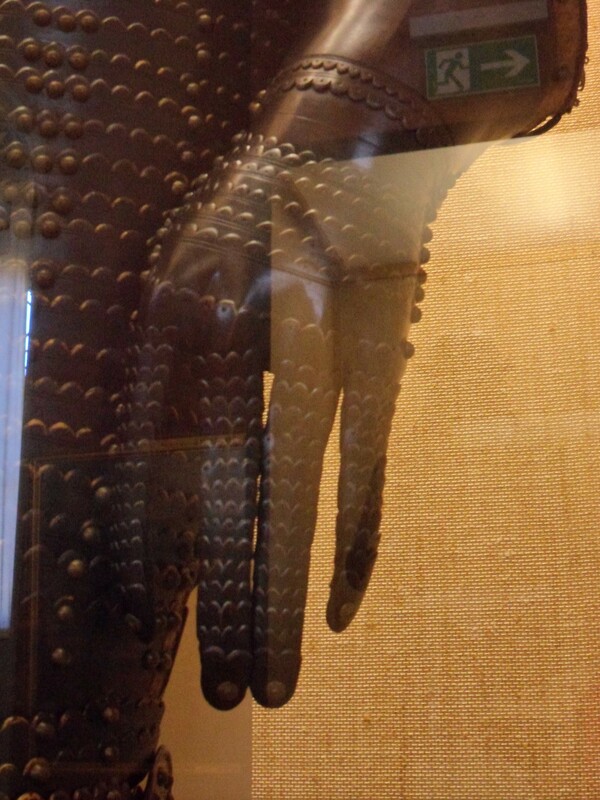 Blackened gauntlets with a scale motif. Gauntlets of small plates were easier to make but perhaps less protective than ones with a plate for each finger-joint and a knuckle-plate in between, or with large plates wrapping around the hands. In contrast, the peak of the armourer’s art in the seventeenth century was suits for the cavalry called cuirassiers. These men fought with pistols and long swords, and expected their armour to be at least pistol-proof in the chest and skull. Most suits are made from large plates roughly shaped and simply coloured, with a few rivets or engraved lines for decoration. Von Spork’s armourer chose to scallop the edges of the individual plates and lames to give the impression of scales, a technique which Japanese armourers also enjoyed. Right pauldron of the cuirassier harness of Johann von Sporck. The German Wikipedia page claims that this harness weighs 36 kg, against the 20-25 kg which was typical in the fifteenth and early sixteenth centuries. Armourers had long struggled with how to protect the insides of the joints. The oldest solution was to cover them with mail. Not much later wings had appeared to stop blows coming in from the side. 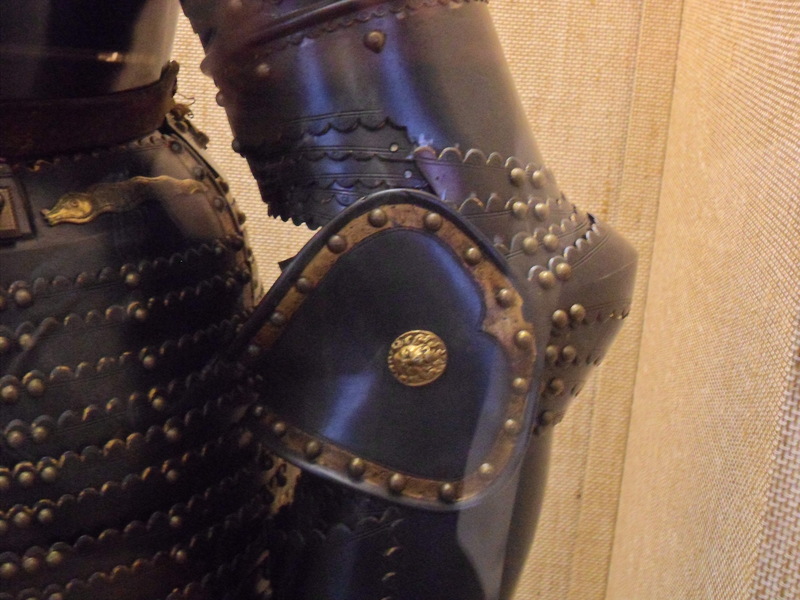 Since at least the 1430s, armourers had experimented with covering the insides of the elbows with articulated lames. Most seem to have concluded that these were too fiddly to bother with. But for some reason, in a last defiant flourish of their art, a few took up the custom again in the middle of the seventeenth century. In the end night still descended upon their profession, but we can still admire their work today.